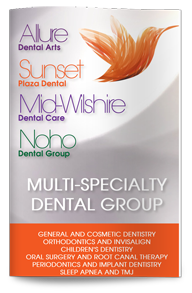 You will notice from your first visit to Sunset Plaza Dental that we take a different approach to dentistry. Our West Hollywood dentist blends science with artistry and health with beauty to create incomparable smiles. Our primary goal is to provide you with the services you need to achieve dental health and help you maintain it. We take special care with our medically compromised patients and our patients who experience dental anxiety, and your health and well-being are our priorities throughout each stage of treatment from consultation to completion. We also emphasize the critical role dental hygiene plays in your continued dental health. We use advanced diagnostics to determine the strength and health of your teeth and the underlying structures of your smile. Our West Hollywood Delta Care USA HMO dental insurance provider will then explore your treatment options with you and make specific recommendations that can give you the smile you want. Our team of dental professionals can treat infected teeth, perfect misaligned teeth, restore damaged teeth, whiten stained teeth and replace lost or missing teeth. The right treatments can take your smile from embarrassed and self-conscious to exuberant and self-confident. Give us a call today to learn more about achieving a better smile or to schedule your next appointment.